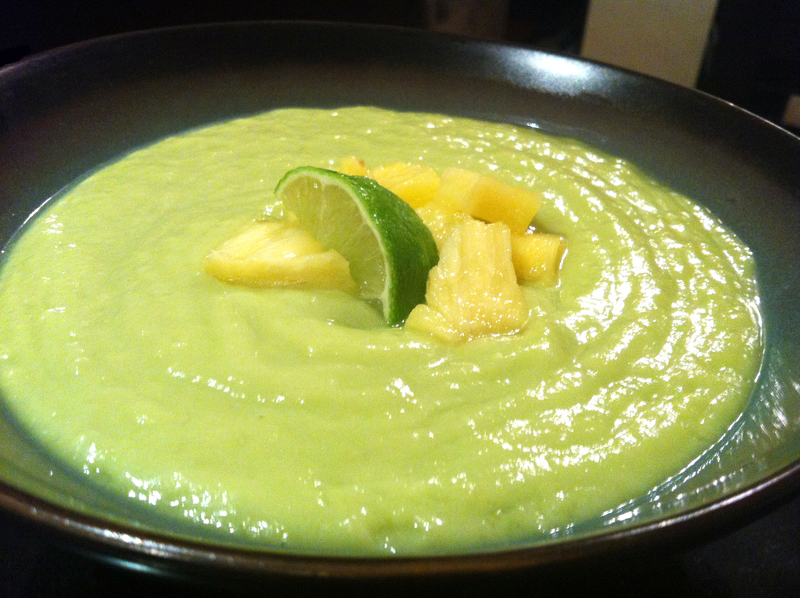 I must admit, this combination, pineapple and avocado sounded a bit odd to me at first, but it is absolutely amazing! (Not to mention extremely easy to make).The best advice I can offer when it comes to this recipe, is do not cut corners. Use REAL pineapple and REAL lime juice. I mean, get a lime, and squeeze the juice out of it. Don’t use the juice out of that plastic green container thingy they sell at the grocery store. I cut corners the first time I attempted, and it didn’t turn out so well. Second time around…completely different story! What a difference REAL food makes! This is one of my favorite recipes. I actually ate this for dinner every single night for 3 weeks on the Clean Program, never got tired of it. I even had it for breakfast the other day! Recipe courtesy of CLEAN (4). Combine all ingredients except garnish in a bowl. Take half of that mixture, put it in a blender, and blend. Add water if thinner texture is desired. Pour blended mixture into the bowl and fold into diced avocado/pineapple mixture. Add optional garnish if desired, serve chilled and enjoy!